Hadn't had the chance to try one of the newest products from Enjoy Life until this past weekend. All I can say is that the package was empty in no time flat! 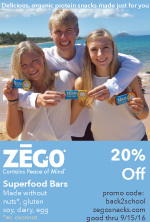 In a household which manages 6 of the top 8 allergens, we LOVE the fact this company is continually coming up with new and enjoyable items for our lunches, snacks and after school treats. 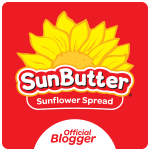 Enjoy Life Sunbutter Crunchy Chewy Bars Review from S.A.F.E. 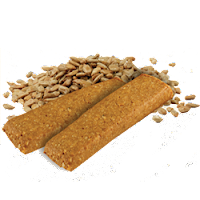 Enjoy Life Oven-baked Sunbutter Crunch Chewy Bars, manufactured by Enjoy Life Natural Brands, LLC, Schiller Park, IL 60176. Ingredients include: SUNFLOWER SEED BUTTER (ROASTED SUNFLOWER KERNEL, EVAPORATED CANE JUICE, SALT), RICE CRISP (RICE FLOUR, RICE BRAN, RAISIN JUICE CONCENTRATE, HONEY, SALT), VEGETABLE GLYCERIN, BROWN RICE SYRUP, BROWN RICE FLAKES,SORGHUM FLOUR, DATE PASTE, BROWN RICE FLOUR, EVAPORATED CANE JUICE, RICE STARCH, GOLDEN FLAXSEED, INULIN (CHICORY ROOT FIBER), XANTHAN GUM, GUM ARABIC, SALT, BAKING SODA, VANILLA. Their website is filled with great resources such as: Recipes, where to buy, coupons you can print up and its very own Resource Center. Our only suggestion is that more bars should be added to the box. Five bars just isn't enough!